of Representatives Mahma Khalil, Wednesday, that is to delete the three zeroes from the currency of Iraq over the next year, returned to the changes, which affected the CBI may prevent the process of restructuring the national currency, as well as having a previous request to the government to wait In the beginning the currency exchange procedures. He was a member of the Finance Committee parliamentary Abdul Hussein al-Yassiri had announced, earlier, that the central bank and according to official communications of the current year starts procedures for deleting three zeros from the local currency, stressing that it would lead to the development of cash transactions and international economic. Khalil said in an interview with "Twilight News", that "the project to delete three zeros from the Iraqi currency had arrived from the Central Bank of the parliamentary economic committee earlier." However, Khalil said that "the Iraqi government has asked to wait to begin the project under false pretenses, although the application and currency restructuring is purely economic projects as well as it contributes to the safety of the national currency." He believes that "the policy of the central bank policy today is unsuccessful, did not succeed in lifting the siege of the Iraqi dinar, and the issue of the currency exchange as she could not keep the hard currency within the environment of Iraq." He described the decision of the Economic Committee that "the interest of Iraq to conduct restructuring of the Iraqi currency and delete the three zeroes, which is a vital economic project and to keep the currency from counterfeiting and damage." According to Khalil, the "There are international companies giant has a desire to implement this project, and sent appliances for this purpose for Iraq," noting that "Iraq is not the only country that is restructuring its currency national, has preceded us Turkey so, as there are many countries that its economy Exhausted the structuring of its national currency. " He pointed out that "the printed forms of the new currency (after deleting three zeros) include half a dinar and five dinars and ten dinars, 25 and 50 dinars, and the parameters of the country and its culture," noting that "if the deletion of zeros, the value of the dinar per be equal one dollar or so." And on the possibility to witness the next year, the birth of the new Iraqi currency, Khalil said, "We serve as the economic and the central bank is linked with us, we demanded from the bank to keep this project exists," but he also said, "The government asked to wait, and I think that what happened on the Central Bank of the changes and the appointment of New Acting Governor means that this project will not even see the light in the coming year as well. " The Iraqi government has decided to end of October last year, set the head of the Office of Financial Supervision Abdul Basit Turki, rather than Shabibi article the former government's decision, after criticism by the parliamentary Finance Committee relating to the mismanagement of funds and addressed to Alshabibi and other bankers officials. The CBI had said in August that it plans to delete the zeros from the Iraqi dinar to facilitate financial transactions made through cash in most cases. 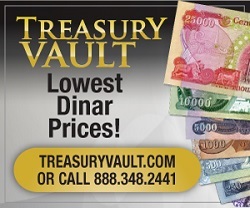 Among the difficulties faced by Iraq if they are to foot on the deletion of zeros from the dinar is pulling about 30 trillion dinars in circulation in the Iraqi market now, then get rid of them and replace them with a new currency.